JET SPUR (AUS) (Chestnut 2002-Stud 2006). 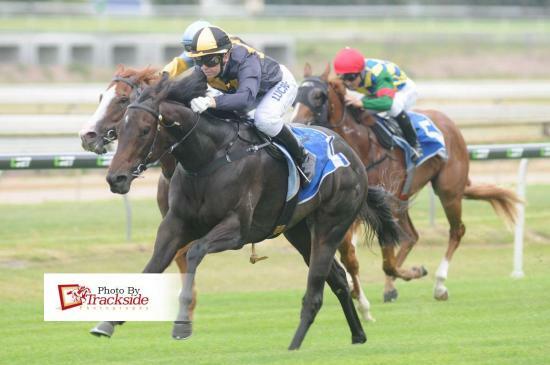 3 wins to 1200m, MRC Caulfield Sprint H., Gr.2. Sire of 391 rnrs, 261 wnrs, inc. SW Mishani Honcho (GCTC BJ McLachlan S., Gr.3), Biggles, Fixation, Black Jet, Belle d'Amour, Emmalene, SP Gundy Spirit, Heza Jetsetter, Equissential, Jam Toast, Jet Down on It, Jetting to London, Splendora, Pickabee, Flying Jet and of Mistral Thief - Breeders' Star (H.K. ), Beau Jet, Lady Jetsetter, Mischievous Devil, etc. Bagus (f. by Jet Spur). Winner. See below. Jetfire (g. by Jet Spur). Winner at 1350m in 2014-15 in Aust. IMPRISONED (Commands). 9 wins to 1300m, A$303,150, STC Missile S., Gr.3, BTC Tails and Veils H., Gregory Terrace Cup H., QTC Conrad Treasury H., BTC Carlton Draught H., Triple M's Totally Different H., QTC Gallipoli Research Foundation H., 2d City Tatt's RC Lightning H., L, QTC Lightning H., L, Wynns Coonawarra Estate H., 3d MVRC Schweppes S., Gr.2, Qld Tatt's RC Kramer Technologies H.
Sovereign Express (Success Express). 9 wins-1 at 2-at 1000m, 1200m, A$143,740, BTC Tate Mason The Good Guys H., QTC Compton Lighting H., Divide & Rule H., QRSE Advanced Data Integration H., 2d QTC Planet Ruler Welter H., 3d QTC Dr John Power H., L.
Diamantina. Winner at 1000m, 2d STC MB Insurance 2YO H.
Jet Suki. Placed at 3 in 2015-16 in Aust. Cockaigne. 8 wins from 1200m to 2050m, A$136,150, BTC Insight Group H., QTC Lyndhurst Stud H., Kaoru Star P., 2d Rockhampton Cup, 3d QTC Rohrig Constructions H., Marist College Ashgrove Foundation P., Corporate Superannuation H.
Synthetic - Perfect Attack (Mal.). 2 wins at 1500m, 1700m, MVRC Sweeney Can Do Agents P., 2d MRC TMB Printing 2YO H.
Sad (Sovereign Red). 19 wins. See above. Tuscon Rain. 4 wins-1 at 2-to 1200m, A$96,350, BRC Epson H., 2d BTC Nilsen 2YO H., BRC Mimiki Foundation H., 3d BRC Coca-Cola Amatil H., Qld Tatt's RC Carlton Draught Country Cup H.
LE VAL (Snitzel). 4 wins-1 at 2-to 1200m, A$253,300, to 2015-16, GCTC Ken Russell Memorial Classic, L, BRC Queensland X-Ray H., Qld Tatt's RC Arcade H., 2d GCTC Goldmarket H., L, BRC Hidden Dragon at Lyndhurst 2YO H., Clem Jones Centre H., Heart of Australia P., 3d BRC Queensland Day P., L.
Single Gaze (Not a Single Doubt). Winner at 2, A$715,900, in 2014-15, ATC CFMEU West Tradies 2YO P., 2d Canberra RC Black Opal S., Gr.3, GCTC Magic Millions Guineas, L, 3d Wyong Magic Millions 2YO Classic, L, GCTC Magic Millions 2YO Classic, L.
Vain Promise (Luskin Star). 5 wins-2 at 2-from 1350m to 1600m, A$141,670, AJC Hanwood Port H., Battle Heights Welter H., QTC Rolls Supper Club 2YO H., STC Truscott's Welter H., QTC Mighty Keys H., 2d STC Silver Slipper S., Gr.2, QTC JF Meynink S., L, STC Clan Campbell H., 3d AJC Marceau Welter H., BATC Doomben Dollars S., STC Castrol Southern Cross Series Final H. Sire. Appease - Giacometi (H.K.). 4 wins-2 at 2-at 1400m, 1600m, AJC Tigris H., STC Hollywood Park H., HKJC Sha Tin Trophy, Remy XO H., 2d STC Adam Casswell H., 3d AJC Hoxton Park H., RAAF H., 4th Gosford Classic, L, Hong Kong Derby, L.
Race Record: 1 Starts 1-0-0 A$18,900.